From one American to another: ‘Happy birthday America!’ We certainly have been through a lot. But don’t worry. We aren’t here to talk politics. We know better! Instead we’re here to reflect on the bigger picture… social media’s influence on US politics, fake news and the American people. Good or bad? We’ll let you be the judge. The fact of the matter is… as we already know, social media is a powerhouse. And it is that “powerhouse” that is taking the world of politics to new heights; including trends like fake news! And what platform holds the most responsibility for the intake of fake news? You probably could have guessed it. Facebook. The network that just last week announced it has officially reached 2 billion monthly active users! That is nearly 30% of the world’s population! But who’s counting? And while the evolution of Facebook is certainly a discussion for another day, the one key thing to note, is the influx of news consumption on the platform. Americans are becoming more and more dependent on various social media platforms – predominately Facebook – when it comes to consuming their daily news, both locally and globally. In fact, 62% of US adults claim to get news on social media, with 18% claiming they do so often. (Gottfried and Shearer, 2016). 62% of US adults get their #news on #socialmedia; 18% of whom do so often. So with that scary fact in mind, where does that leave us in terms of the distribution of fake news? Let’s take last year’s election for example. According to research conducted by Buzzfeed, in the final 3 months running up to the election, 20 of the top-performing false election stories from hoax sites and hyper-partisan blogs generated over 1.3 million more shares, reactions, and comments on Facebook than those from 19 major news sites including New York Times, Washington Post, and the Huffington Post (Silverman, 2016). Coincidence? We think not. The fairytale that is quick consumption, doesn’t necessarily mean what we are reading is factual. Um… hello, just because you saw it online doesn’t make it true. However, one thing is for certain, in these uncertain times: Fake news are starting to make us question – now more than ever – the validity of what we see and read. So much so, that in a study conducted by Politico, 60% Americans are now starting to question traditional news outlets, with 40% blaming them for pushing personal agendas (Sutton, 2017). So how does this leave us, when it comes to consuming news on social media? Down right “seeing stars and stripes…” and not the American flag. 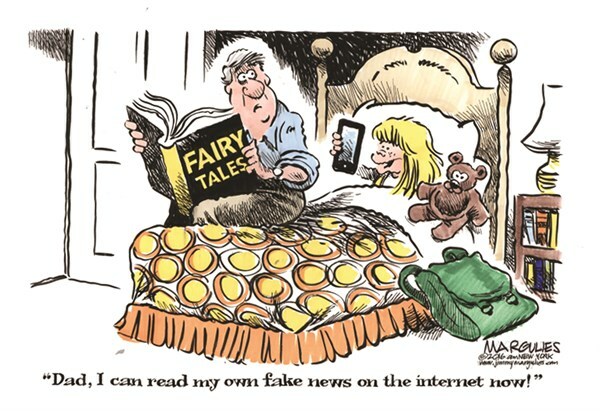 Mass media is leaving us massively confused, and not being able to tell the difference between “real” and “really fake.” In fact, according to Forbes, research conducted by Pew found 39% of Americans are very confident, and 45% somewhat confident. that they can spot fabricated stories in their News Feed. Ironic or not, a poll by Ipsos for Buzzfeed News found that 75% of Americans who recognised a fake news story from last year’s election still viewed the story as accurate (Edkins, 2016). Scary right? 75% of Americans recognised #fakenews and still deemed it accurate. So how does this have an effect on our understanding/consumption of politics and news? The impact is unprecedented. Like brands, the world of politics now sees the strength in the manipulation of data to both produce, and distribute, social media content. For example, according to Cambridge Analytica, last year’s election’s use of big data and advanced psychographics helped to pinpoint susceptible demographics of US citizens and their passion points to sway their votes. And all through the means of social media – some of which included fake news! (Brandt, 2017). So, kudos to those politicians and companies drilling down and playing the game through the use of data and influence. But the buck has to stop here. #Fakenews tagged to politics… the buck stops here. The real question is: ‘What’s is being done to avoid fake news surpassing its virtuous competition?’ Well, countries like Germany think platforms including Facebook aren’t doing enough to protect people from false information. So much so, that they have been calling for heavy fines on those platforms allowing the use of deceit online, both for personal and political gain (Cellan-Jones, 2017). Even 71% of Americans think platforms like Facebook need to step in and put their foot down. And while Facebook took a stand on the matter in December of last year, by flagging possible fake news, the company is also going a step further with the production of a set of tools that launched in May, aiming to stop fake news in its tracks. However, the media and some government bodies call it ill-fated and laggard. So, the moral of the story to America and the world is ‘Just because you see it online doesn’t make it true.’ If you see an ad, or fake news story, challenge it. Click the arrow in the top right hand corner of a post and go to the ‘i: Why am I seeing this post’. You’ll be amazed at what you’ll learn about Facebook targeting and the influence of your own online behaviours. So, ‘Happy Birthday America!’ Fake news doesn’t have anything on you. Or does it?